Not everyone on a budget enjoys the slumber-party atmosphere of a hostel. Certainly, the vibe and design veer much more towards bespoke boutique than haphazard hostel. 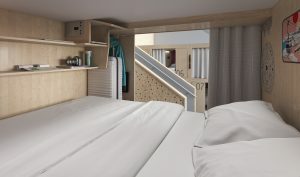 A streamlined, wood-panelled pod snuggly fits a double memory-foam bed, individually controlled lights, a mirror, artwork, a built-in fan, a few hangers, a small lockable cabinet for your valuables, with just enough storage left over for your suitcase. The pods don’t have doors but are, rather, equipped with a thick, heavy curtain. Though a curtain may not seem ideal, it’s preferable to a mass grouping of open-air bunk beds that allow for no privacy or soundproofing and that are common in most hostels. The elegant, stylish pods were loosely inspired by Tokyo’s capsule hotels. In all, there are 88 pods spread throughout eight chic suites. Suites can hold anywhere from six to 18 pods each. Each suite (one of which is female-only) boast unique en-suite bathroom areas that are divided into individual sections to promote privacy and limit line-ups. The individual components feature washrooms with vanities, showers that include a place to change, stand-alone vanities and changing rooms. 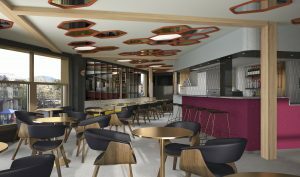 Pangea also features several shared spaces where guests can mingle. The Living Room, a funky lounge, bar, café and espresso bar all rolled into one, features floor-to-ceiling windows overlooking Whistler’s Village Stroll. The Rooftop Patio gives Pangea bragging rights to Whistler’s only true rooftop bar, and it offers a lovely view of Mountain Square. And what self-respecting Whistler hotel would be without a place to store your skis? The Toy Box is an open-plan secure storage spot for all of your winter sports accoutrements, including skis, snowboards, mountain bikes and more.